I have this theory. Every food is better with a fried egg on top. 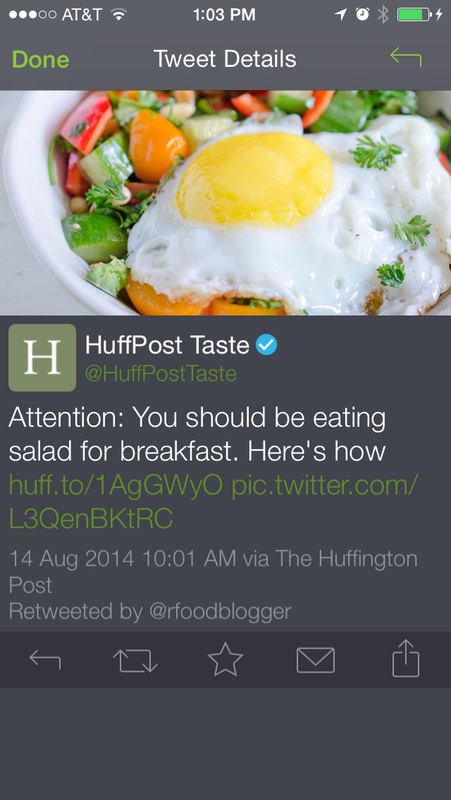 I challenge you to think of a dish that isn’t better with a fried egg on top. You can’t because there isn’t one. In this recipe the runny egg-yolky goodness combines with a basic vinaigrette to form a creamy, tangy dressing for the veggies. 1) Arrange 2 handfuls of baby greens in each of 2 bowls. 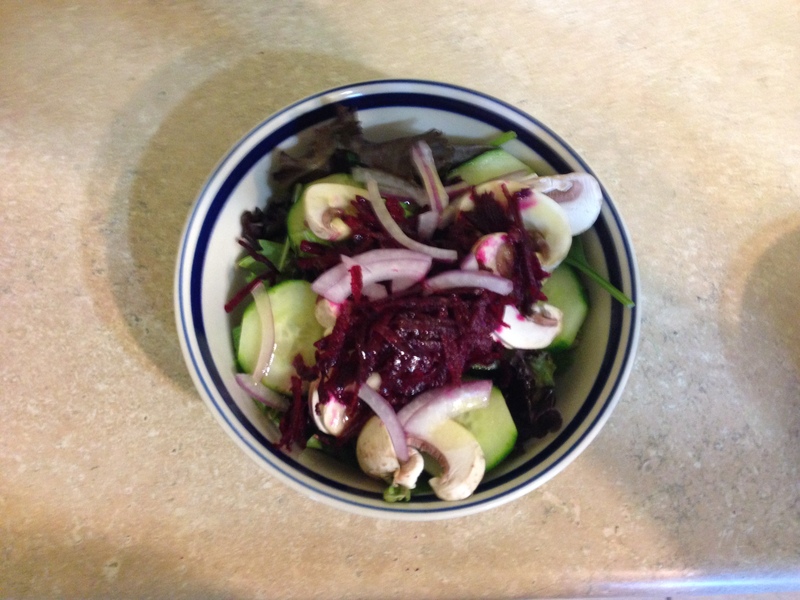 2) Slice mushrooms and onion, peel and slice cucumbers, peel and grate beet and set items aside. 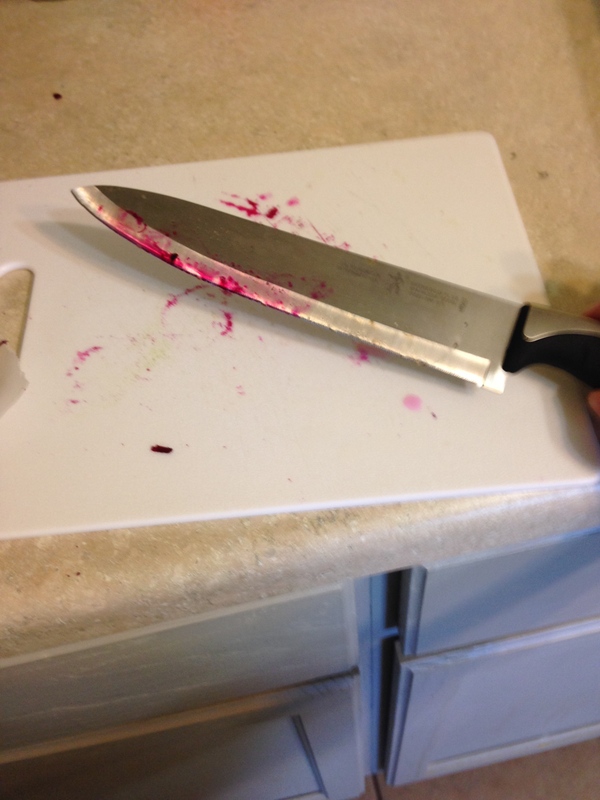 Whenever I make beets it gets all Dexter-blood-splatter in my kitchen. 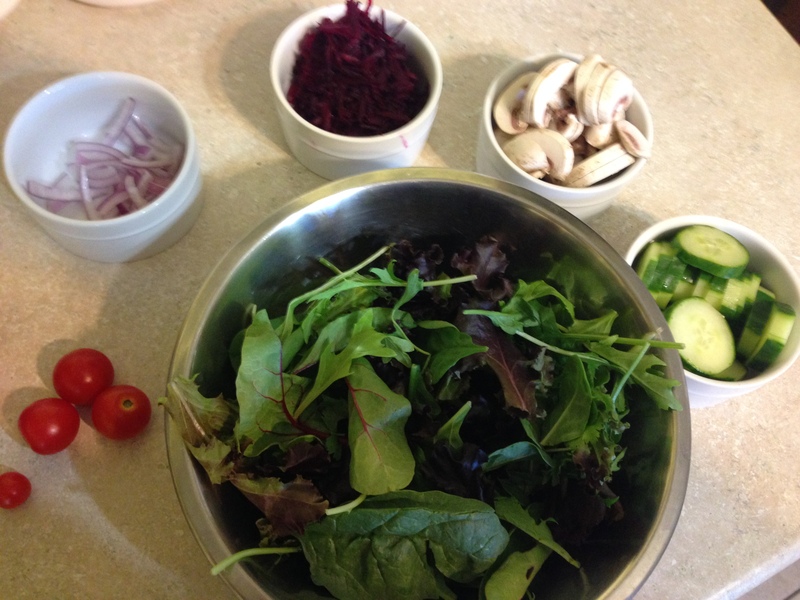 3) Arrange the above equally in each bowl, with grated beet on top. 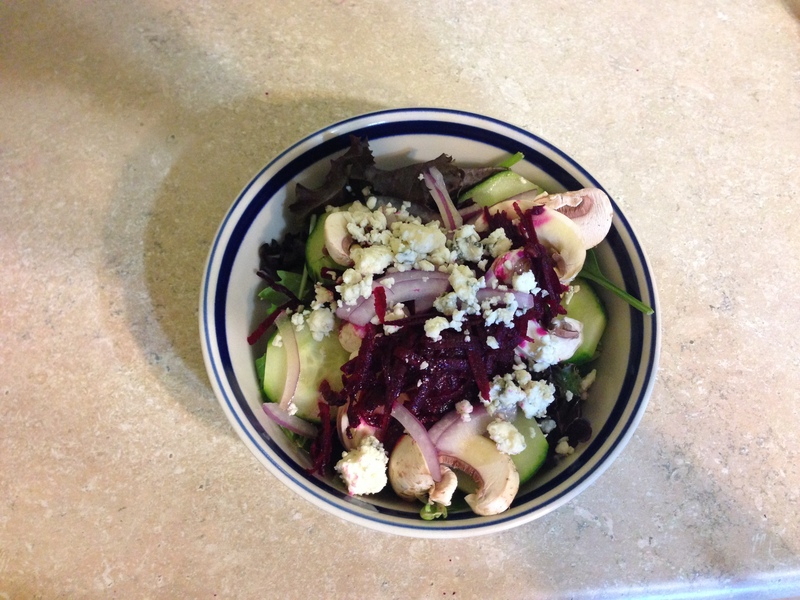 4) Top each salad with blue cheese crumbles. 5) Squeeze lemon into glass measuring cup, add an equal amount of EVOO (approximately 2 oz). 6) Whisk lemon juice and EVOO until combined, add salt and pepper to taste, if desired. 7) In a small pan, fry eggs, until whites are translucent and yolks runny, about 5 minutes. 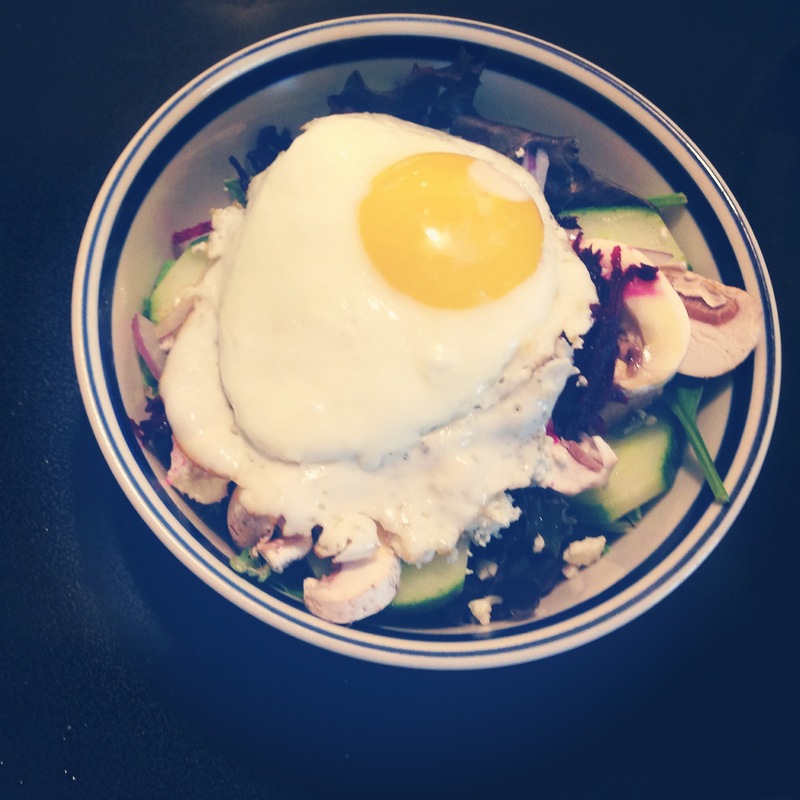 8) Top each salad with a fried egg, and drizzle with lemon juice/EVOO mixture. 9) Before eating, stab egg yolk with fork, letting yolk combine with lemon juice/EVOO.